Vault is a very quick event. The gymnast only performs one skill. However, in order to help your athletes, become better at vault it is very important to dissect the skill. Breaking the skill into pieces allows you to work on different parts of the vault on different days. 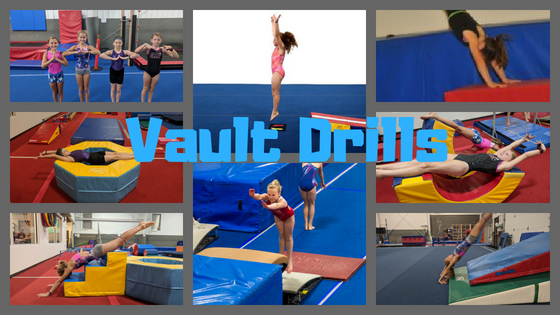 Check out these ideas for drills for each part of the front handspring vault. 1. High knee running - Have your gymnast hold a block out in front of their chest. Instruct them to march and lift their knees up to the block. Next, move to running with knees hitting the block. 3. Acceleration - Have gymnasts practice start at one end of the runway and walk to the first marker, jog to the second marker, and then sprint to the end. 1. Increase the length of the hurdle - Roll up a towel and place it on the springboard to hurdle over, unroll the towel a little more with each successful hurdle. 2. Arm Circle - Give each gymnast one bean bag or scarf for each hand, have them run and hurdle with the bean bags, instruct them to release the bean bags when their arms come in front. See how far the bean bags/scarves travel. 3. Toes in front on the springboard - Place a parachute on top of a wedge, from a short run the gymnast will run and hurdle to their back on the parachute. This drill will over emphasize the feet in front. The parachute will slide when done correctly and makes for a great ride. Or, have the gymnast run up and down mat steps and hurdle to a pike sit on the mat. Again, overemphasizing the toes in front. 1. Body Tension- Have the gymnast practice holding a tight, straight body on a rainbow. Gymnasts can practice this shape with their belly facing up or down. 2. Heel Drive - Instruct the gymnast to stand with their back facing a mat and have them jump and drive their heels into the mat behind them. Bonus drill, have the gymnast jump and drive their heels and then fall forward onto a rollie. 3. Diagonal Line - Using mat stairs practice holding a diagonal handstand. Once the static hold is mastered, try having the gymnasts vault over the steps to handstand flatback or front handspring. 1. Push through your fingers - Teach your athletes to block using the entire hand. Have them put their hands together and push them apart with the fingers separating last. 2. Blocking Up - Build steps with panel mats and have your gymnast push through their shoulders and hands from one step to the next. 3. Block Quickly - Put a wedge against the wall and an 8" mat on the floor. Have the gymnast perform the Pop, Lock, & Drop drill. Gymnasts arm circle into the wall and push away from the wall while remaining tight. 1. Body Tension - Have the gymnast kick to a handstand in front of a donut mat and fall to their back remaining tight. If the gymnast loses tension and pikes they will fall into the donut. 2. Teaching Toes Up - Have the gymnast kick to a handstand in front of 2 wedges and fall keep the toes pointed up. 3. Focus on the the hurdle and pre flight first to make the post flight easier.